310 was purchased at auction, put new back tires & rims on it. Had been setting for long time, due to owners health probs. and eventually estate sale. Got running & freed up foot clutch will recieve paint job next year. Use for mowing pasture & pushing snow. Run & works very good. Both tractors have triple range trasmissions, with foot & hand clutches for live pto/hyd. The 311b has power steering, many new parts, but am going to have to overhaul engine. 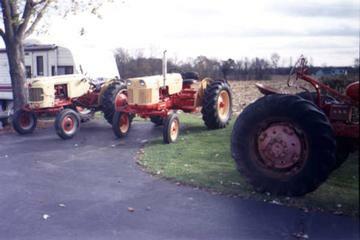 We like both tractors.